Annecy is a lovely town in a beautiful setting, at the north end of Lac d’Annecy. There are little villages around the lake with their own hotels, restaurants, and even beaches. It’s a very popular tourist area. We stayed in Saint-Jorioz, half-way down the west side of the lake. As for cycling, I’m not so impressed, although that might partly be because we were here for a week and really didn’t get much good weather. I no longer ride in the rain, and don’t like riding by myself in gray, cloudy, windy conditions. But also Annecy doesn’t have the big, spectacular rides that some other areas have. I would recommend other places to ride before Annecy. Col du Semnoz is supposed to be the most difficult climb in the area. We didn’t ride the hardest route up it, but instead did the route that Will at Cycling Challenge calls his favorite. While I enjoyed the lower part (photo on left), I didn’t think much of the upper part which was about 13 km, mainly through the trees, with views only in the last 1.5 km. The whole climb was 27.4 km with 1,350 meters of climbing. Start in the center of Saint-Jorioz near the Tourist Office. Head south on the main road by the lake to the first roundabout, then turn right on D10B, following the sign for St Eustache. Follow the road as it switchbacks gently up the hillside, until you reach a T-junction. Turn left on the D10 and ride through Saint-Eustache and continue to the Col de Leschaux and the intersection with the main D912, which you reach after 14 km. Cross the D912 and follow the road as it climbs the flanks of the Semnoz for just over 13 km. You’ll see cycling markers showing the kilometers to the top and the gradient of the next kilometer. This is probably the classic ride in the Annecy area, going around Lac d’Annecy on a wonderful bike path, but taking a detour over the short but steep Col de la Forclaz. You can obviously start anywhere on the loop, but make sure you do the ride counter-clockwise. The south side of the Col de la Forclaz is much better than the north side. You will be on a great bike path most of the way round the lake, with three exceptions: the road over the Col de la Forclaz, a short section of road north of Talloires, and a short section of road on the west side of Annecy old town. The whole loop is about 49 km. Ride down the west side of the lake on a bike path the whole way. Continue past the end of the lake, heading for a big shoulder that comes down into the valley. Just past the shoulder you reach a roundabout where you turn left on the D42 following the sign for the Col de la Forclaz. The climb is about 8.5 km with 680 meters of climbing. It has several kilometer sections where the average gradient is either 10% or 11%, with short sections where it reaches 12-13%. It’s a steep and pretty climb. Once at the top you’ll see signs advertising parepenting, via ferratas, and other outdoor activities. Ride down the other side with beautiful views of Lac d’Annecy, until you reach a T-junction about 8.5 km from the top. 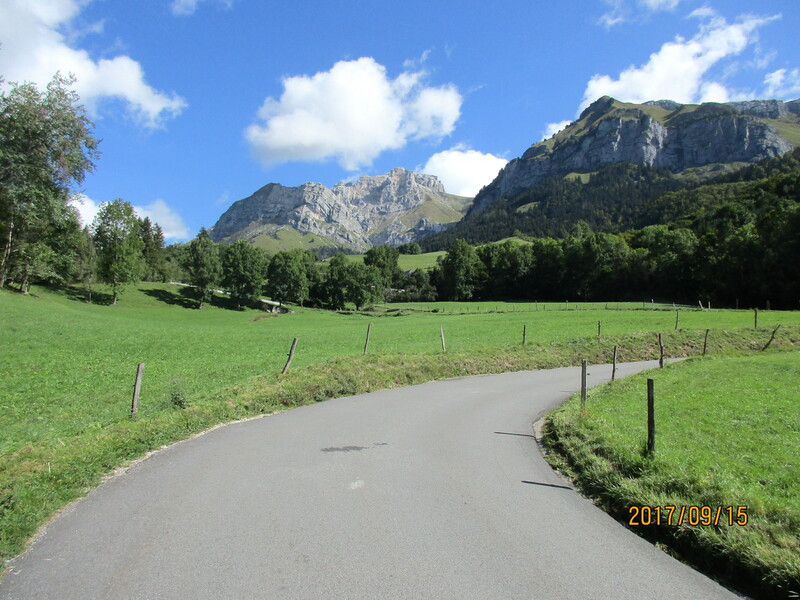 The left road leads down to Talloires, but you’ll be turning right and immediately getting back on a bike path. Follow this for a few kilometers till it ends, then ride on narrow roads for a few more kilometers. About 6.5 kilometers after the T-junction you’ll see a small sign on the left telling you that the Annecy bike path is starting again. Follow this all the way round the end of the lake to the old part of Annecy. The section around the end of the lake is lovely as it winds along the lakefront, but is much more crowded. Eventually the bike path crosses the main road and you will have to ride on roads for a short way until the west side bike path starts again on your left. Annecy is part of the Savoie Mont Blanc region and this region has a cycling brochure that covers the whole area, as well as some cycling web pages. 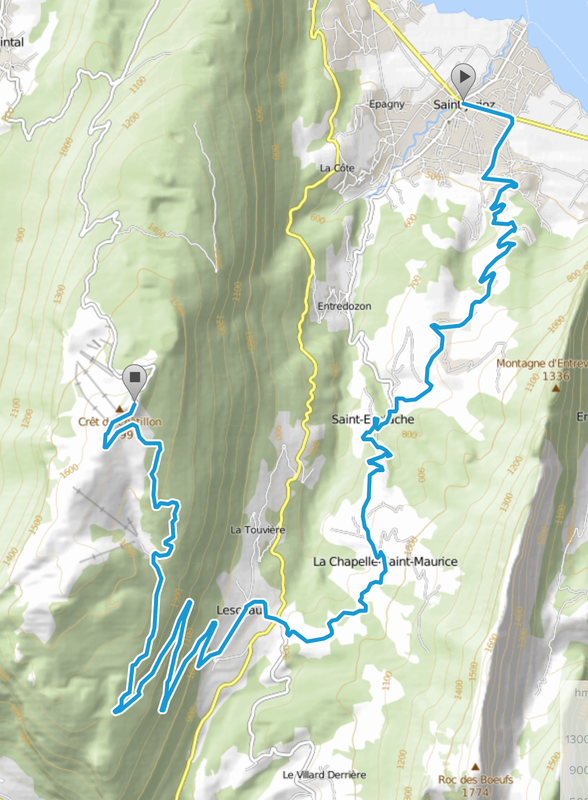 There is also an excellent phone app about cycling in the Savoie Mont Blanc area which is available for iOS and for Android. 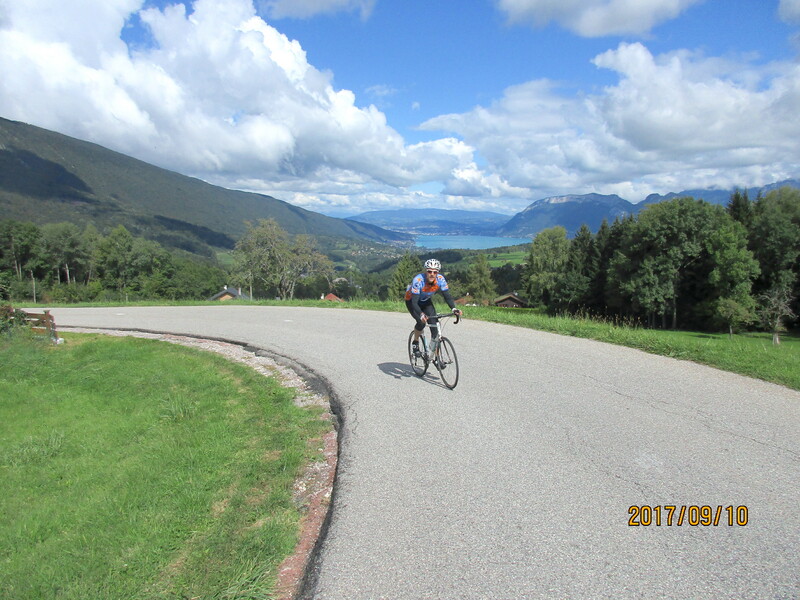 Will, at Cycling Challenge, has a web page devoted to cycling around Annecy. I’m linking to this page as we didn’t do much cycling in the area, mainly due to miserable weather.